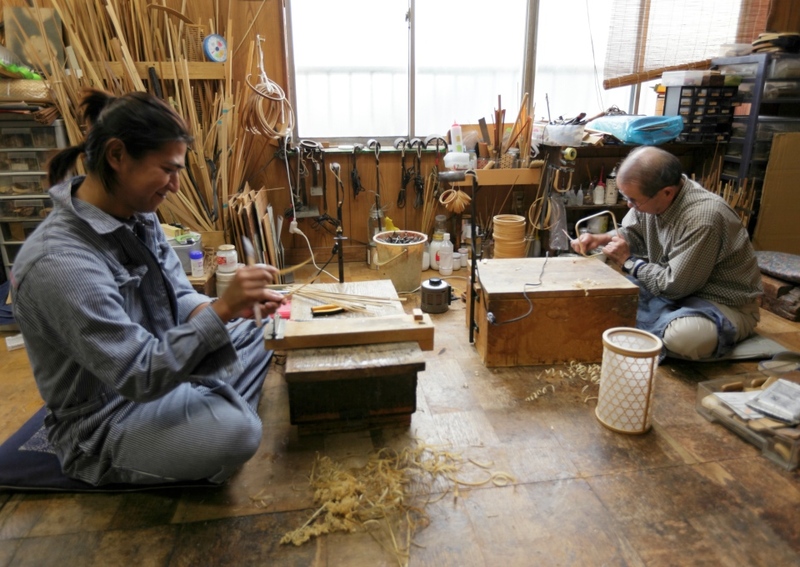 【Personal history】Shigeyasu Sugiyama, 37, a craftsman of Suruga Bamboo Ware. He was born as third son of Masayasu Sugiyama (A craftsman of Suruga Bamboo Ware and the Chairman of Miyabi Andon Factory today) in 1974. After graduating his high school he took apprenticeship to learn concierge service at a hina doll shop in Osaka for 6 years. In 2000, he then became apprenticeship to Tetsuo Watanabe, a Traditional Craftsman at Miyabi Andon Factory, and started to work on creating many products. 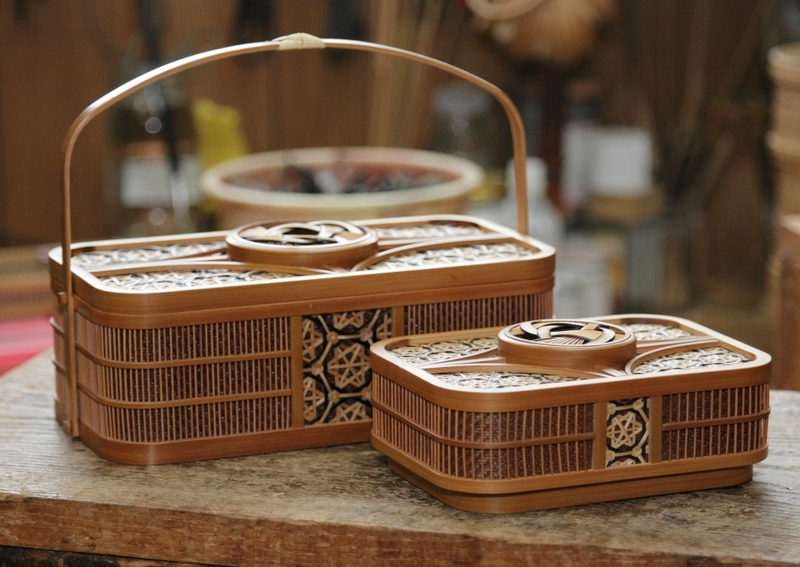 A Shizuoka’s local art craft “Suruga Bamboo Ware”, which dates back to the early Edo period, is featured not only with its preciseness realized by Maruhigo made with strands of bamboo but also with its robustness for long life and the color tone that changes to light brown as time goes because of bamboo’s particularity. At the International Expo held in Vienna in Meiji 6 (1873) where craftsmen placed their bird cages and cake boxes on show, the arts attracted visitors from many countries, and then it has become developed as one of Japan’s representative exporting products. 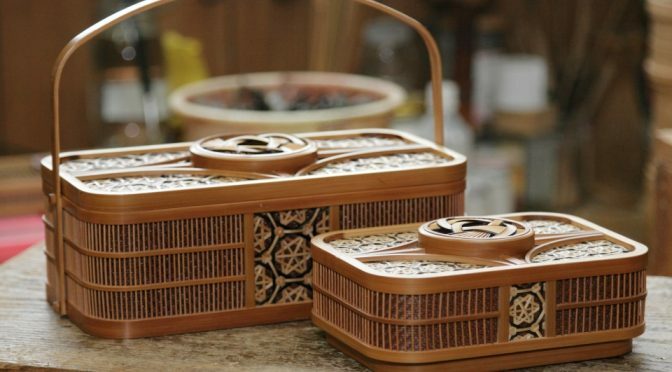 Today, a wide variety of products from traditional ones to those with elaborate decorative works are produced. The factory we visited was Miyabi Andon Factory, placed in a residential distinct in a short drive from Shizuoka station of Shinkansen, that we were told three brothers are striving to lead tomorrow’s traditional art crafts. The person welcomed us was the 3rd-oldest brother Shigeyasu Sugiyama, with an impressive friendly smile. 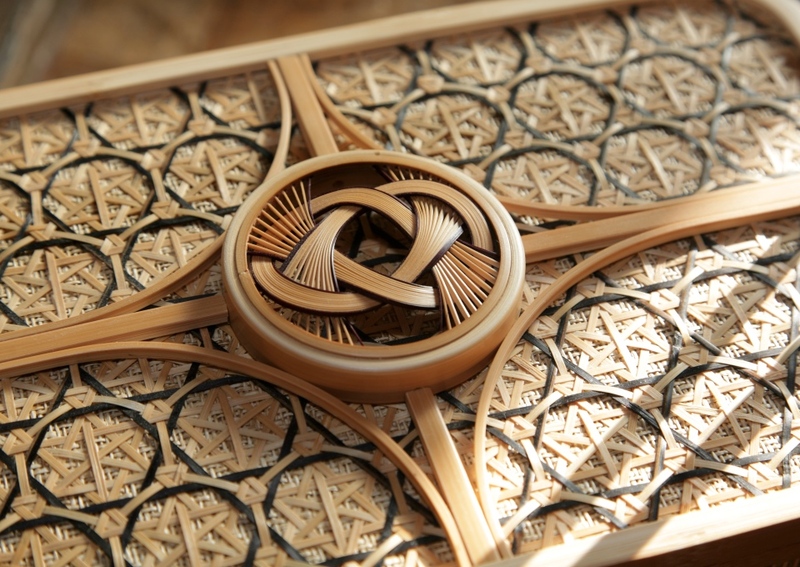 A cake box of Suruga Bamboo Ware with its impressive patterns. Miyabi Andon Factory Ltd. The first floor is the office, the second floor is a studio, and the third floor is the warehouse where stock is stored. It has been about 2 years since he took over his family business after he finished his apprenticeship for as long as 6 years. 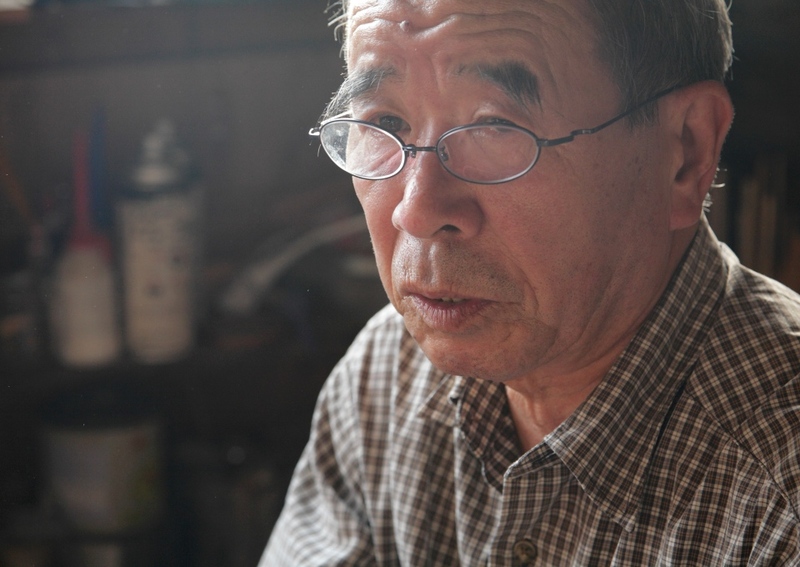 The Chairman, who is his father, asked Tetsuo Watanabe, who had kept working as a Traditional Craftsman but was going to close his factory, to employ him at Miyabi Andon Factory to hand techniques over to the next young generation. This triggered Mr. Sugiyama to apply for full apprenticeship to Mr. Watanabe. 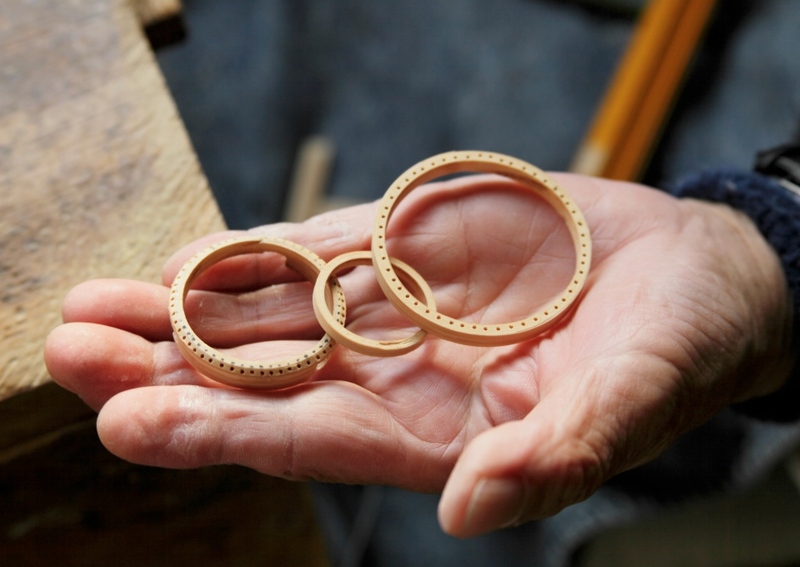 “My apprenticeship started by shaving bamboo material with a knife. On day when I kept the shaving work I felt pain not only in a muscle but also in bone. I asked Mr. Watanabe for advice and he only said ‘Do not try to shave the bamboo’. I could not understand what he meant at that time, but I now feel there is no more suggestive message than it. The more I try shave, the more the knife bites into the material and it does not smoothly go forward. Then I put more force unconsciously to manage this situation… I finally understood why he said ‘Do not try to shave the bamboo’. After that, I could become able to relax my shoulders, keep knifing work longer, and the number of bamboo materials I work on per day jumped up”, Mr. Sugiyama looks back on his apprenticeship period. Mr. Sugiyama also says Mr. Watanabe teaches his techniques not only to him. “My superior holds an event ‘Young players development school (Tradition preservation school)’ on every Tuesday that I participate in. Young craftsmen who work under other superiors participate in this, and the benefit for many of them is to have opportunities to learn techniques that are different from those learned from their superiors”, says Mr. Sugiyama. 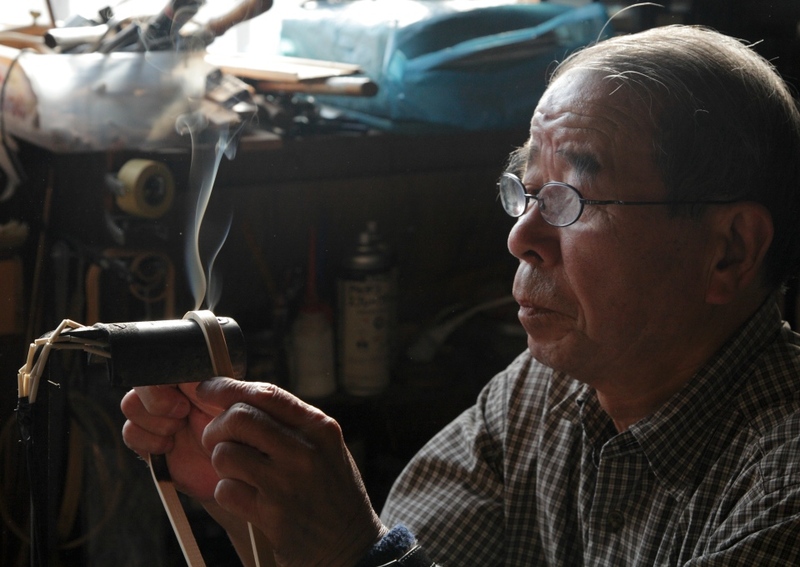 【Personal history】Tetsuo Watanabe, 76, a Traditional Craftsman of Suruga Bamboo Ware. He started his apprenticeship at the age of 16 and became independent at 27. For the great contribution he did on successor development, he was certified as a Traditional Craftsman at 42 and has kept its position up to today. We were allowed to step into his atelier located at the second floor. Mr. Watanabe (right) and Mr. Sugiyama (left) are working silently at the studio. The work, to make it split into strands only by bending from side to side by hand, looks like a magic. 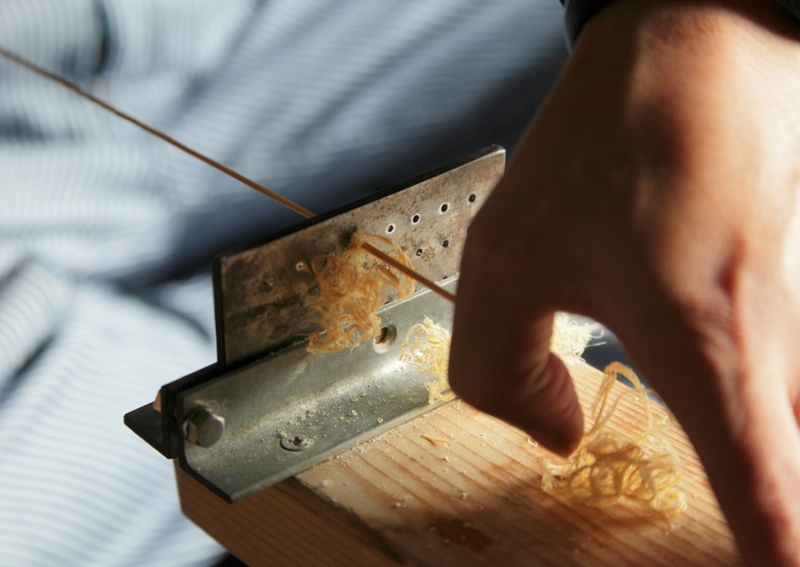 “Higos” become complete by getting the strands of bamboo in sequence into a small hole where a blade is formed. You may become absorbed in the scene of the smooth work. 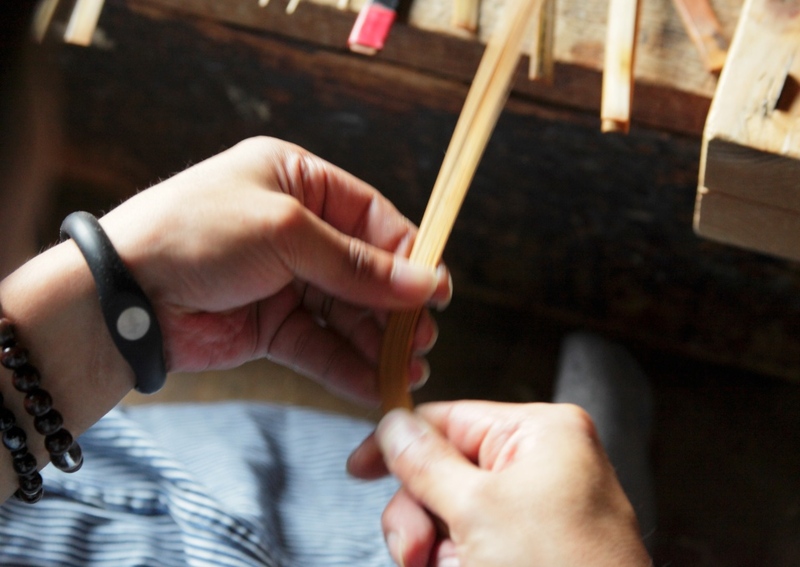 The next process Mr. Sugiyama introduced us was “Mage (bending)”, the most difficult one in Suruga Bamboo Ware making process and be the key driver for quality of product. “If you perform Mage by heating in summer, the length of bamboo material becomes longer until it gets cool. In contrast, it gets shorter in winder, so you have to consider such expansion and contraction when you perform it. The basics is ‘Maru-mage’, using a tool called Doran heated to bend bamboo strands, and my superior is also good at performing a higher technique called ‘Shikaku-mage’ using a heated iron for bending. Maru-mage is performed only at once, but Shikaku-mage is performed in four steps. 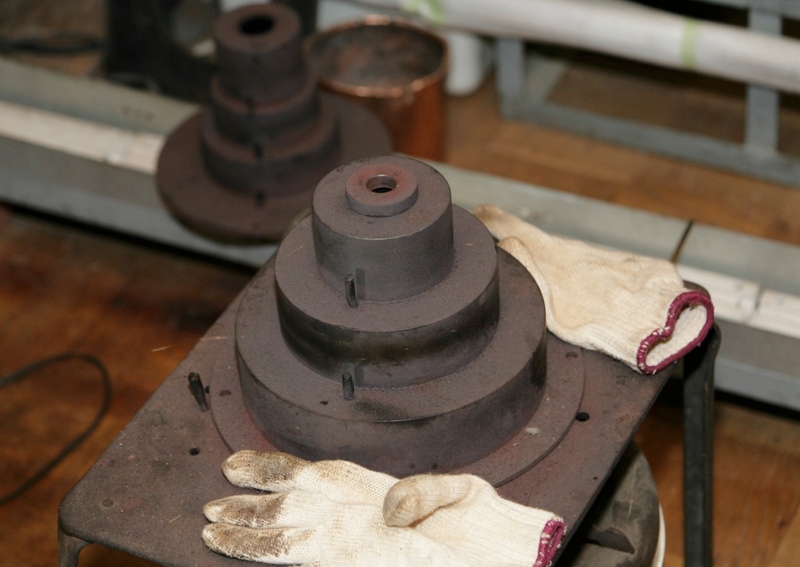 If you think it simply, you should be able to imagine that you must take into consideration all the strains possibly happen while bending performed four times and the related expansion and contraction. Lastly you make holes by a wimble with the help of symbols marked prior to performing Mage process. Final products become complete after getting Higos go through the holes. I feel grateful for opportunities to learn high techniques such as Shikaku-mage, and more than that, I met my superior”, Mr. Sugiyama explains with a smile. A tool called Doran, heated when making bamboo materials into rounded shape. This tool has been said in use since before the War. A circular piece “Maru-mage (bent in rounded shape)” of 40mm in diameter made upon a specific order for a tubular microphone cover (center in photo). “This was in the smallest size I have never experienced so I had to create specific area on it by using a plane and a chisel for circular connection. It was a tough work”, says Mr. Watanabe. “For ‘Shikaku-mage (bent in rectangular shape)’, in order not to make the material broken, the point you must keep in mind is to heat the area around the portion prior to bending, never try to bend it at once”, says Mr. Watanabe. 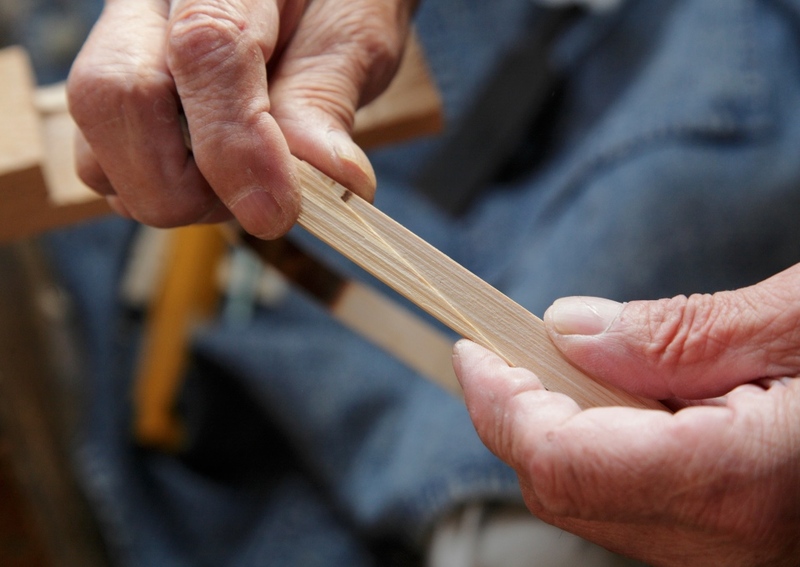 After “Shikaku-mage” completed, the craftsman finishes the connection area by plane and chisel in order not to leave gap, and make it connected by adhesive. Lastly, Mr. Sugiyama talked to us about the way he wants to go as a craftsman. Not “Commodities for everyone at a low price” but “Valuable products for those who feel pleasure to own them even at a high price”. 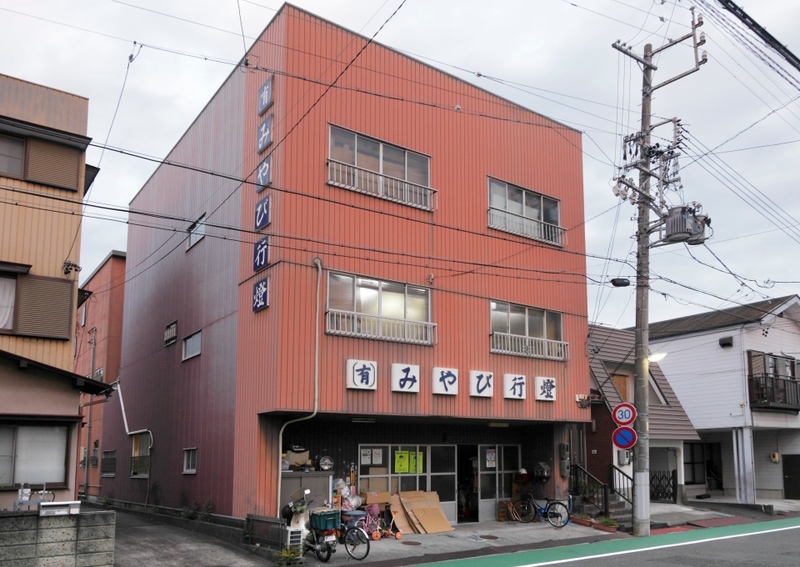 With such mind, Mr. Sugiyama and the craftsmen of Miyabi Andon Factory are striving hard for “survival”, a common challenge like a mission that a variety of traditional art crafts faces. Their passionate attitude made us think of what the real thing is, what the tradition means. A traditional pattern “Awaji-musubi” that Mr. Watanabe revived. “I hope people take up my product and feel its lightness and robustness”, says Mr. Sugiyama. 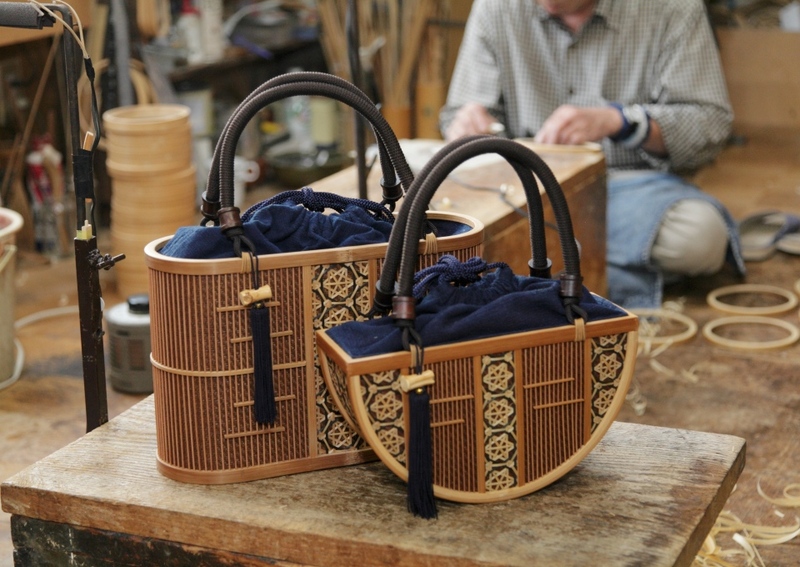 Bags with a local craftwork “Suruga Wazome (dying)” incorporated look nice with casual dress, even such as jeans. 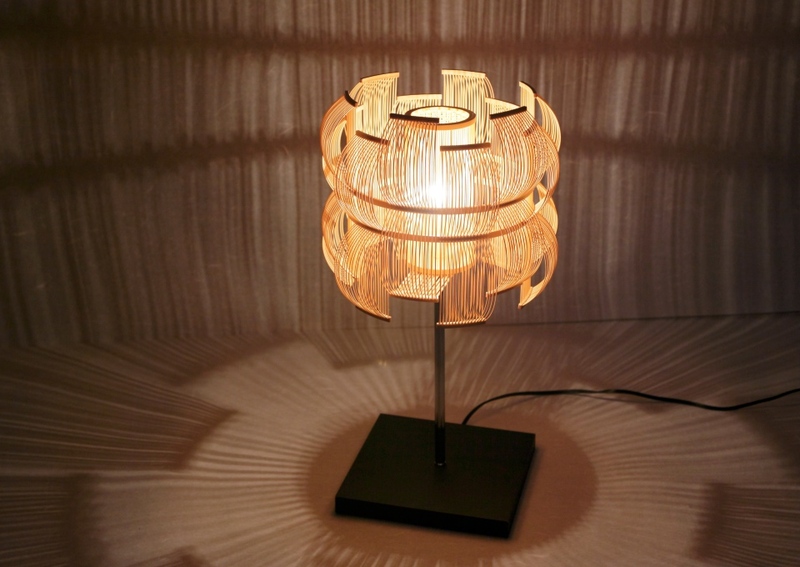 Lighting equipment “SEN” created in collaboration with Toshiyuki Tani, a lighting creator. “We did not have right understanding on requirements specified in his drawings, and he, the lighting creator, did not have knowledge in detail on our Suruga Bamboo Ware. Thus we asked him to stay in Shizuoka for several nights to share a comprehensive image of the product we had to jointly finish”, says Mr. Sugiyama.